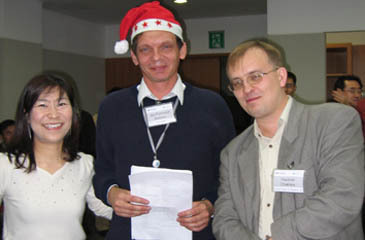 The Samsung Advanced Institute of Technology — famous for paying attention to their workers — hosted a '04 Christmas & End of Year Party for International Colleagues. 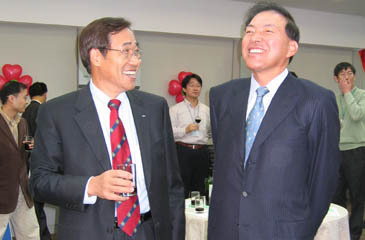 It is one of the numerous events going on during a year in which Samsung has hosted such events like the Samsung Summer Festival and others; not to mention regular company dinners, celebrations, and different occasions of the SAIT family. To keep corporate spirits up, Samsung publishes a monthly journal titled "Leading the Next." 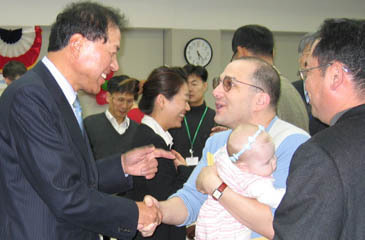 Chairman of SEC Global Collaboration and CEO of SAIT Lee Yun-Woo (left), shakes hands with Seth Ansell, Imaging Solution Program Team, carrying his young daughter. For the third time since 2002, this year's festival was organized by Ms. Si-Nae Kang, who helps SAIT`s foreign employees adjust to their working life in Korea. 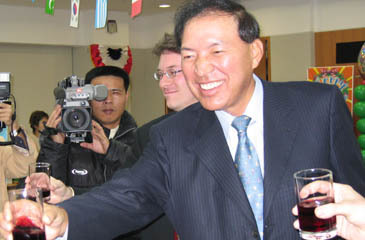 During the festival, officials communicated with colleagues in a relaxed atmosphere. Vice-Chairman of SEC Global Collaboration and CEO of SAIT, Lee Yoon-Woo, extending greetings, and Executive Vice-President of SAIT Chung Sun-Whee addressed the meeting with a closing speech. Also in attendance were foreign workers from 14 different countries with their families. 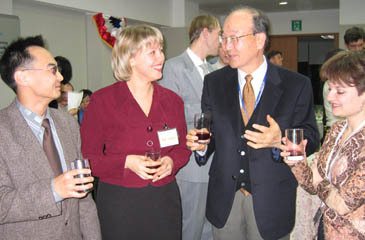 SAIT`s foreign employees have a friendly chat at the '04 Christmas & End of Year Party. In order to put guests in the mood for the Christmas party, carollers sang favorite Yule Time songs. 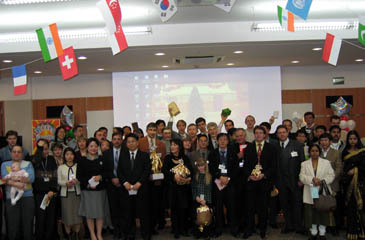 The singing of Korean songs by foreigners and other national songs added flavor to the Christmas & End of Year Party. Also, almost all guests took part in the holiday performance. The gala was abound with quizzes and games. Some guests from countries such as Switzerland, Morocco and India introduced a visual presentation of their country. SAIT`s foreign employees and members of their family pose for group photo. 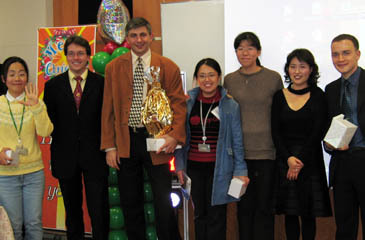 At the end of the party there was a prize awarding ceremony and after that attendants took a group photo. These events unite colleagues and stimulate them to work harder for a common result ?the prosperity of their company. 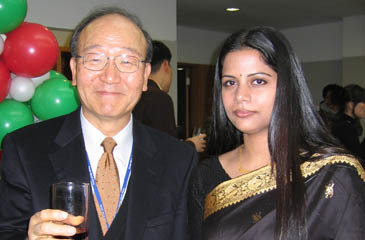 Events like these help foreign workers adapt to their new life while at the same time makes things more interesting.